I work in an interesting field: Antique dealing in the modern world. It wasn’t always that way – when I got started, over 25 years ago, I still had to go from place to place, auction house to auction house. But that’s how I fell in love with the world of antiques. Some of you may know (and some of you may not) that despite my French sounding name, I was born and raised in England and so it’s no surprise that Antique Silver Tea Sets are a personal joy of mine! English Tea Service is supported by a rich and diverse history which, inevitably spread across Europe and into North America. This history is not overly pressing when consulting a professional appraiser about the price of your antique silver tea set. However, when dealing with such exquisite works of art, it will only enrich the experience to imagine where it came from. It’s certainly something many silver tea set buyers take a great pride in understanding. When looking for silver tea sets for sale, or for interested buyers, you also want to consider how complete the set is. Smaller sets may contain just the tea pot and perhaps a creamer and sugar bowl. The more pieces you have in your set, the more ‘complete’ it is, the more drastically you will see the value rise. Going back to my original thought of how the antique dealing world has changed, almost everything is done online these days. I get a lot of phone calls or e-mails from people who are rightly a little nervous about where to sell their silver tea sets online. It is a very impersonal experience. While I do, first and foremost, encourage people to take their time to find someone they trust and feel comfortable dealing with – I’ve made it my goal find a way to bridge these two worlds (the online and the offline). 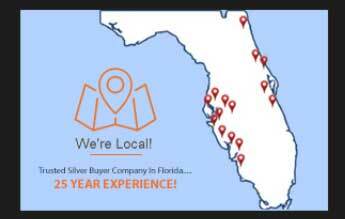 Everyday I get e-mails from curious new customers who want to know more about their silver, I’ve contained my business exclusively within the state of Florida so that I can be available, not only through e-mail, but by phone and in person to offer the best price and instant cash on your silver and antiques. I hope that, whether you are looking to sell your silver tea set or are looking for a stunning new addition to your next afternoon tea service, that you have a wonderful time discovering the vast history and artistry that has gone into countless styles of tea sets around the world. Sterling Silver or Silver Plated: 3 Simple Tests!